So delicious!! thank you for recipe! My family totally enjoyed it! I make this desert ALL year!! I usually buy several bags of fresh cranberries when they are in season and keep them in the freezer just so I can make this when cranberries are not available. By far the best “skinny ” crumble, others I have tried are dry. I love that it’s a easy recipe as well. Used smart balance (salted was all I had) instead of whipped butter (3 points vs. 9!) and omitted the half tsp of salt and cut the chopped pecans to 1 1/2 TBS (instead of 1/4 cup). Otherwise was totally delicious, would recommend making in ramekins as it was hard to keep the 8 portions separate as it was a little runny.. This is amazing and was a tasty and beautiful addition to the Christmas table. Oh my word, this was DELICIOUS!!!!!!!!! Sooo hard to keep from eating the entire pan! haha! I made this with agave syrup. It was very good — not to sweet or buttery. I doubled the recipe and made it for my family for Christmas. They LOVED it!! We're big lovers for Christmas pudding but they all preferred this. My dad is a massive fan of apple crumbles and said it was the best he had ever had. DEFINITELY will keep making this! 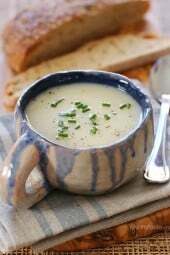 What can I use as a substitute for the butter in this recipe? We don't use butter or margarine in our diet. Thanks! Maybe I made some kind of mistake (but I don't think so) or maybe it's better with agave, but the honey completely overpowered this for us. It satisfied the older kids craving for dessert, but my husband and I were disappointed. I have loved every other recipe I have tried from your site! This was fantastic! Cranberries aren't available yet at our neighborhood grocery store so I used all apples instead. I also made it gluten free since I have a wheat allergy. It was super yummy and a hit with our dinner guests – no one even noticed it was gluten free. I even got a request to make this for Thanksgiving dinner! I made this dessert one night, and the first thing my picky kids said was "when are you making this again?" I would make it year round if I could get fresh cranberries! @Kate. I agree that it is hard to know what to do and what is "right". Sientifically the stuff is not good for you, I had a scientist friend explain agave and the process in which it is made…and he is not even into "good" eating. He said to stay away from it. "they say avave is the best – the healthiest." to Anonymous above it is not the healthiest it is WORSE than HFCS, it is like toxic sludge. Stay far away from the stuff! Main stream foodies may say it is healthy but once upon a time so was margarine, and we know better now. I have spoken with many very very educated whole foods type people and they said it would be better for you to eat white processed sugar than agave. cannot understand why this gal, uses the stuff in her recipes, it is horrible for you! Prior to those reports, when they said agave is good for you, I was using it all the time. Of course one day the say something is good for you, the next it's not. Now I am using honey in place of agave. You can substitute agave with honey, rice, date or any other syrup. But they say the agave is the best – the healthiest. But still all these syrups are better than regular white sugar:)..
Gina – thank you again for a wonderful recipe! I love everyone I try! I wanted to make a dessert to have after dinner yesterday and searched your website and found the apple cranberry crumble recipe. Was thrilled I had all the ingredients, even cranberries (had them in the freezer). Only ingredient I left out were the nuts, as I can't eat pecans or walnuts. It was so good. My husband and daughter loved it too! Definitely will make it again! LOVE IT! Will be making it again for sure! I'm making it for the 3rd time! It also tastes great with greek yogurt. I cut way back on the sweets and it still tastes great. Makes a delicious breakfast. To those who have asked about using craisins (dried cranberries) instead of fresh or frozen… I just made this with craisins and it is INCREDIBLY DELICIOUS. I am about to eat the whole pan. 🙂 Thanks for so many amazing recipes, Gina!!! I have made this several times since Christmas and everyone loves it! My question is could you use Craisins when you can't find fresh or frozen cranberries? Gina, I wanted to tell you that I'm just now getting an opportunity to try this as we went out of town for Christmas shortly after you posted it. Thank you sooooooo much for remaking this recipe! My family and I all enjoyed it immensely this evening. I really was wondering if it was going to turn out as good as the original and I can honestly say, yes, it absolutely did! Thanks again so much for taking the time to do this. I hope others are also enjoying it. This was a raving success at the Christmas dinner (and days after with leftovers) Thanks so much for the recipe! I'm happy you all liked it! You would use the same amount of sugar in place of agave. And sure, this would make a great pie filling, but not sure about the baking time. My sister was in charge of dessert today. I sent her the link to this and she made it – SOOOO GOOD!!! She now loves your site as well. I've made about 5 of your other recipes and everything is always delicious. Thank you – thank you!!! Merry Christmas! Made this tonight for our Christmas dessert and it was excellent! Thanks for the great recipe! made this tonight and everyone loved it! and I have a family of picky eaters. Made this for my family Hanukkah dinner and everyone loved it! I left out the nuts because we've got a couple young ones that can't eat them. 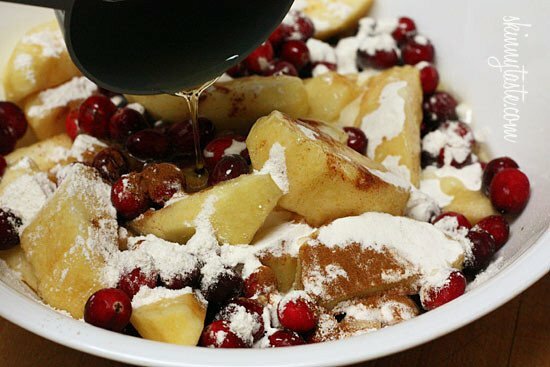 The combination of apples and cranberries is genius!! Love your recipes! Making this gluten free- corn starch is GF so that's fine, GF flour mix is fine, but the only GF oats I can find are not quick cooking. Will this still work? I just discovered your blog. I can't wait to try your recipes. Gina this was great! My husband loved it, and we both were wondering if the mixture would be a good filling for a pie ( obviously it wouldnt be skinny anymore) but we were thinking maybe we can use the filling with a lattice pie and serve it at xmas eve dinner. Think that would work with the same cooking time? Emily, for gluten free I would be a gluten free flour mix, they sell them at Trader Joes, King arthur also makes one. This would be fine made 2 days ahead. I recently discovered your site and have already made quite a few things.. I plan to make this for my Christmas morning dessert for my family. I'm sure we will enjoy! This recipe was delicious. I used pears instead of apples. I found 2/3 cup of agave nectar to be too sweet. Next time I will cut back on it to see the results. 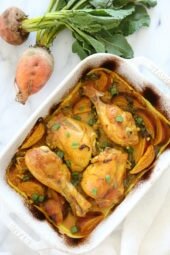 Is it OK to make this 2 days ahead and store it in the refrigerator? For those who want to have ice cream with this….go to Trader Joes and get the vanilla creamy vanilla. All soy and DELICIOUSSSSSS. Fabulous! Took this to a small potluck this evening!!! Was asked to share the recipe. My husband enjoyed the leftovers. Will definitely be making this again!!! I just made this for some friends and it got great reviews. It was very yummy! We ate it with vanilla frozen yogurt on top. Great recipe. Thanks for sharing. We can't get fresh cranberries here in Oz especially this time of year. Might try blueberries? Hmmm, I think I might make this but sub half of the apples for sweet potatoes. I love sweet potatoes with cranberries and apples. Oh my goodness, these look yummy. I'm with you – I can skip the cookies, but a good food cobbler is hard to resist! This sounds great. I believe this is what I will be making for desert for Christmas. For Thanksgiving, I made the Creamy Grape Desert and it got rave reviews!! Keep up the good work. Is this a dessert, or a breakfast?? I guess it just sounds so yummy, I want to eat it for all meals!! To the 26 point question. I am just returning to WW and I am STARTING at 26 points. It's not impossible. Plus you have your 49 extra points if you go over a couple…. Even using 29 points per day, you are still only using 21 of your available 49…. You can do it! Just try to plan ahead. That is my issue…. the unexpected. 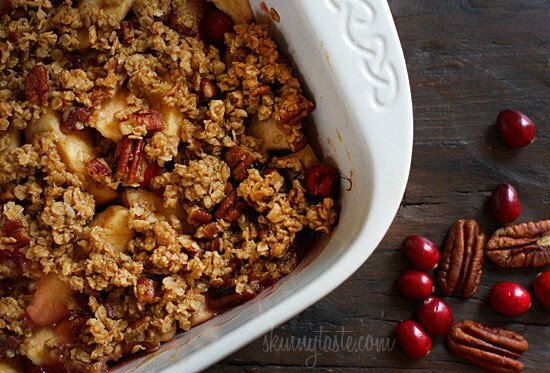 I have been making Cranberry Apple Crisp for the holidays for nearly 30 years now. Everybody loves it. My recipe is for a 9 x 12 baking dish. 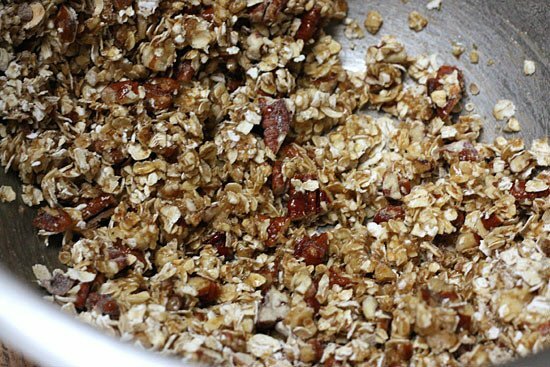 The apples and cranberry mixture can be frozen ahead and finished off with the oat crumble (which can also be frozen separately) before baking. It's one of those dishes that puts me ahead of schedule during hectic kitchen prep. Thanks! Looks delicious! I can't wait to try this! Also, visit me over at The Savvy Kitchen (www.savvykitchen.blogspot.com) to enter my giveaway! Wow! This looks great! However, my family is not big on cranberries. How do you think it would turn out if I subbed in fresh cherries? Do you think frozen would work? I'll be honest, I haven't paid attention to the changes on WW. Yes, serving size is the same with sugar. I would make this, then re-heat. Just needs to be warm, the microwave is perfect to warm it up. This is my favorite dessert! I just love a crumble, a brown betty and a crisp. 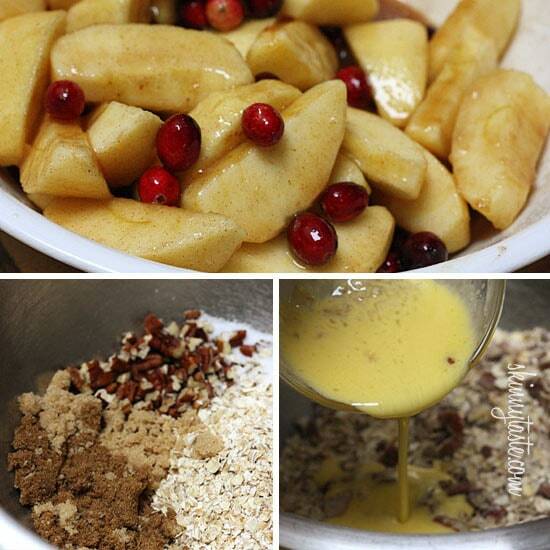 I love the flavors of apples and cranberries together! This I will definitely make! Thanks Gina, I LOVE your blog! 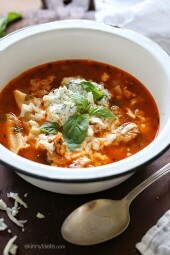 Gina, thanks for remaking this recipe! I can't wait to try it! Here in Portugal we only have dried cranberries, and we don't have pecans… and I simply LOVE pecans, but I only get to eat them when I travel to the States. I love fruit crumbles!Looks great,delicious! 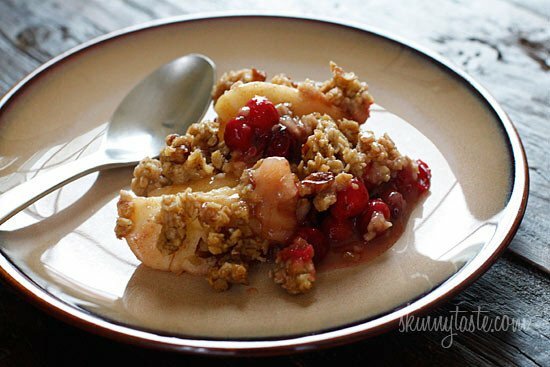 Cranberries go so well in crumbles with apples or even pears! It looks amazing! This sounds very yummy. Question Gina… Are you or any others who have 29 points plus a day going down to the new 26, this seems nearly impossible!? Sounds like I'll be cutting even this crisp in half! I love this recipe, and is a good Idea for my Christmas party in my work, Thanks Gina!!!!! I just love when your recipes look delicious and when I have everything on hand! Thank you! without a doubt I know this is delish without even tasting it. Looks great! If using sugar instead of Agave, would it still be 2/3 cup. How would you suggest reheating, oven or microwave? Thanks. I know you said we could make this ahead and simply reheat when ready to it. However, I was wondering if you could your prepare it and keep it in the fridge and bake it when ready to eat – like a day later. Do you think that would work?? Yeah, this is my weakness. I can skip the cake and cookies, but this is right up my alley!! I had a little fat free whipped cream with this, but why not some fat free yogurt or frozen yogurt! This is such a yummy looking holiday treat! Yum! would it make much difference if i leave the nuts out? (allergies) looks great though!! I have about 1 cup of cranberries left from decorating with them (candle holders and vases) and I'd love to give a cranberry recipe a try since I've never actually cooked with them. 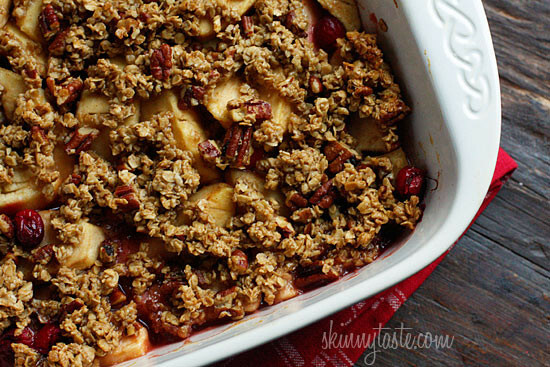 A great combination of apples and cranberries with a crispy topping. The problem is that this makes me want vanilla ice cream to go with it!!!! Looks amazing Gina! Looks delicious! 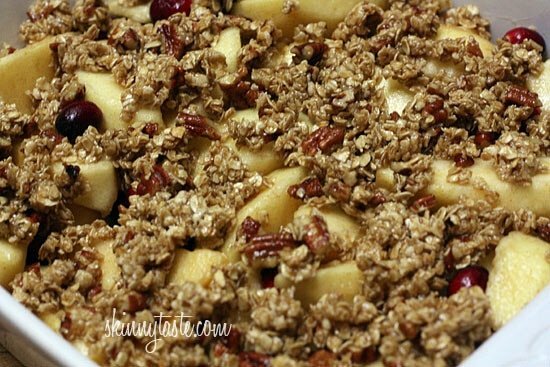 Apple crisp was always of a favorite of mine. Love the addition of cranberries! 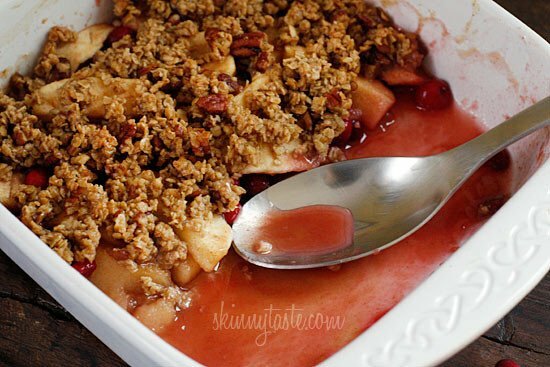 Beautiful – I love fruit crumbles/cobblers. This looks wonderful! Question, by "2/3 cup agave," do you mean the nectar? Looks sooo good. I love a good oaty crumble topping.